Becky White is either one of the smartest or luckiest people that I know in that she gets to do what she loves for a living. I think you'll agree with me after reading my interview with her that she's a lot of both. SP: Tell us a little about yourself. BW: I have been dog crazy my entire life. I think a strong "dog gene" was passed down from my dog-loving Grandmother. She would often have two or three in her home, with some of them being rescues. Childhood photos of myself are shown with dogs and all kinds of animals big or small. I have always been at ease around animals, and was blessed with parents who allowed a huge variety of pets to live in our home over the years. This truly was a gift learning to nurture and be responsible for others. SP: How about the dogs that you currently have? BW: I presently own two yellow labs, Abby (aged thirteen) and Ember (eight years of age). SP: Dog Walking and Boarding. I understanding how someone could quickly get into the dog walking business. It seems that there aren't a lot of folks who expand into a full on boarding business. How did you get started? BW: I actually fell into the business when I hired a dog walker to walk Abby when I was working out of the home years ago. She and I became friends over time as I trusted her with our dog and the other dogs that she walked. She suggested I could board dogs on weekends as there was a need in our community for at home boarding. I had never heard of such a thing as this concept was fairly new ten years ago. Owners were boarding their dogs at their breeders, which often required a long drive, or relying on family members to pitch in and help. The other option was to board your dog at a kennel where dogs are often in runs and can be crated. I gave it some thought and discussed it with our family, my husband and two daughters who were school aged. We decided to give it a go with only one dog coming to board with us at a time and only through referrals from my dog walker. This worked out nicely and slowly word got out that I boarded dogs in our home. I decided to quit my job that paid poorly and kept me away from our girls to try and build my business. This was a wonderful decision as I could be available for our daughters, work from home and be my own boss. Our community has a lot of dogs so I realized I was very fortunate and knew many people from the school yard and our church. Today, I have my own dog walking and boarding business in Toronto, Ontario. SP: That's great. It sounds like it's a rewarding endeavor. Was there anything that you learned jumping in with both feet the way you did? BW: Early on I learned many lessons which I will share with you. Always pre-screen a dog before a regular board. I request dogs spend 24 hours with us initially. The owners get to see our home, meet our family and our dogs. The visiting dog gets to know us, our routine, and a warm relationship begins (treats included to sweeten the deal!). I get to see how the dog walks on leash, how it responds to commands and if there are any red flags like counter surfers, leg lifters on furniture or on carpets, or if a dog is way too stressed while away from it's owner. I can judge how it is with other dogs and around people or if it has any quirks. I have learned to have owners fill out a contract I have set up with vital information. Their personal information, emails, cell numbers and their vet. I have them fill in an amount they would pay at their vet if they could not be reached in an emergency situation if out of the country. Some say unlimited, others a fixed amount until they can reached personally. All dogs must be spayed or neutered and be non-aggressive. All shots must be up to date. SP: What are some of the special requests that owners give you? BW: I ask about dog quirks I should know about like dogs that chew socks or kleenex, or if there are any fears like the vacuum. All owners provide their own food and medications if needed. Special toys are welcome to have a dog be at ease or a bed they love, even though I provide three around our home. If a dog is crated that comes too to keep the routine the same. My job does impact our dogs. They have to share their family and personal space on occasion some toys. With my screening process only easy dogs come, so pretty much stress free. 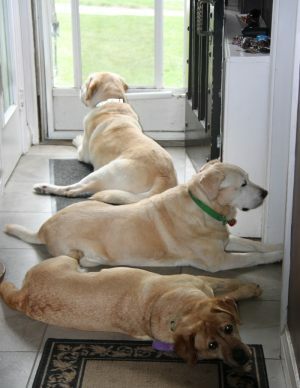 My older lab has her favourites that come; it is obvious when they arrive. There is a lot of tail wagging on the greeting and often Abby will bring a toy to the door to say hello. All dogs are fed at the same time but away from each other to avoid any issues. I keep out two water bowls and the dogs know where to find them. Certain times of the year are busier and we embrace the quiet spells and pour on extra TLC. Ember is our new addition. The concept of taking on an older dog really came from your site. I had written a post on my blog called Senior Dogs and the Gifts They Bring. You contacted me after reading it and we learned more about each other's work. I was fascinated about SeniorPooch.com concept and he in turn learned about my blog which was only a few month's old at the time. His devotion to finding older dogs a forever home became a thought in the back of my mind. We were thinking of adding a second dog to our family but years of experience with puppies had me thinking of getting a mature dog. The perks were obvious: skipping the puppy stages and training and giving a loving home to an older dog. At my local off-leash park I kept meeting owners with rescue dogs and hearing their wonderful stories. I took this as a sign and convinced our family we would add an older dog as it felt so right in my heart. 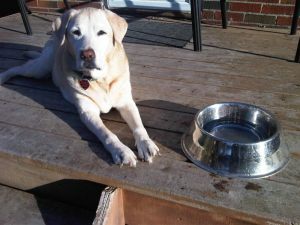 Ember was retired from breeding and we found her at a first class Labrador breeder here in Ontario. We wanted another lab and we were told to visit. The breeder had three available to the right home. Ember literally chose me right away. She came right over to where I was sitting on the floor and tucked her body in beside me. Her tail was constantly wagging and she gave a big lick on my cheek. I was smitten and we brought her home. She was two weeks shy of turning eight. We figure she has wonderful years left and we can provide her a perfect retirement. She is loving and sweet and we feel expresses a real genuine feeling through her eye contact to us and full body wags when talked to :) I have heard from others that have rescued dogs or taken in an older dog this trait is very evident. We feel like she has always been with us. We had her spayed to seal the deal on her retirement from motherhood. SP: I can't express in words how honored that I am that some small bit of what I shared helped you make your decision. It's awesome that you've made the difference in bringing another senior into your home. How has your experience with older dogs affected your business? BAW: When walking or boarding senior dogs I am in constant contact with the owners. We discuss any changes from my last hands-on experience with their dog. I also share my observations although some families can be in denial that their beloved pooch is heading into the last part of their life. I understand this, as it is the hardest part of being a dog owner, accepting the end is near and that a dog needs to be put down. I bought special stairs for a huge Goldie-poo I walked on occasion to assist him getting into my van. He was fine on the walks at the off-leash but getting up into the car was the only special modification needed. Sometimes when older dogs board I put down more carpets to provide traction. They often cannot pull themselves up on a slippery floor. One old Irish Setter- Retriever that boards needs a physical boost to get up into a standing position but once she is up she has no issues with walking. I am used to the many of the meds senior dogs take and get all the details from the owners written down before they go away. Two other observations I have noted with Senior Dogs are the loss of vision and hearing that often occurs. I turn on bright lights in our garden at night and assist with the three steps down into our garden for the last pee of the day. Depth perception seems to be the problem on stairs with older dogs. SP: Great! Which brings us to your other passion and how I found you: writing. BW: After many years of having my business with dogs, friends and contacts said I should start writing down my stories. I kept hearing this and when 2011 was coming to a close I thought 2012 was the year to start blogging. My eldest daughter helped set up the site as this was foreign territory to me, and I had a handful of other bloggers as wonderful mentors that coached me along the way with some dos and don'ts. I love the creative process writing and I cannot believe that I am being read world wide. I have amazing supporters who have spread the word through Facebook and by sharing links. I cannot believe I have written 61 articles so far. It is a super hobby that I highly recommend. The best part is meeting other special people and their dogs and sharing it online. So many are inspirational, like a boy in Ireland named Murray and his service dog Clive who I wrote about and a friend here in Toronto who fostered a dog for nine months to be a future service dog. The love of our dogs is international and they are such great connectors. 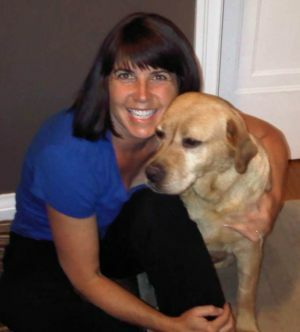 I have written about tributes to a senior dog that families have come up with which would melt any heart.One family had a tree planted at The Lions Club Foundation of Canada facility in Oakville where future service dogs are trained. Another client did a video on Youtube of their dog's life showing video and snap shots going from his older age backwards to when he was a puppy. I had a client try a holistic vet for her senior dog to see if it could help her after feeling her regular vet had tried everything. SP: You already know how much a appreciate the educational, inspirational, and heart-felt posts that you share on a regular basis. Is there anything else that you want to share? BW: This past year, six dogs I walked or boarded died in their senior years. I cried at each one's end as they each have a place in my heart. Their family lives became mine over the years as we developed a deep friendship. I shared their celebrations like a new job, a house reno, the birth of a child or the addition of a new dog. On the other hand I was there for them when a family member was in critical condition, a job was lost or an illness had them housebound. The hardest part was the break of the bond we had with their dog being the connector. We do keep in touch but it is not the same. Senior dogs are unique and are a reminder of our human senior years to come! It is our job to love them, be their voice and "give back" for their lifetime of joy they have brought us and to others. If you like SeniorPooch.com even a little bit, I'll personally guarantee that you'll love Becky's Dogs Twenty Four Seven Blog.